The name for galoshes originated in the Middle Ages when many styles of boots from short to long were popular. The word came from Gaulish shoes or gallicae, which had leather uppers and soles carved of wood; when the Romans conquered the territory they called Gaul (France), they borrowed the Gaulish boot style. Nobles wore red leather, which told observers of their aristocracy, and the wooden soles were often ornately carved. Galoshes and boots are very closely linked in footwear history, and sometimes the words are used interchangeably. Properly, however, a galosh is an overshoe that slips over the wearer's indoor footwear but is made of waterproof material to protect the more delicate materials of the shoe as well as the wearer's foot from cold and damp. In the early days of boots, particularly those made for ladies, the boot was made of fabric and capped or "galoshed" with leather. Laced closures tightened the galoshed boot around the ankle just as fasteners on modern galoshes secure them. Cave paintings show that the first boots were worn as early as 13,000 B.C. The first attempts at galoshes may have originated more than 4,500 years ago when separate leggings were wrapped around the legs above moccasins to protect the wearer from cold, rain, and prickly plants. The moccasins were extended to form boots. However, most boots were made of pieces, and joins between the pieces allowed moisture and cold to creep in. The first boots were probably created in northern Asia, and, as the wearers migrated across the Bering Strait to the Americas, their creations traveled with them. The Inuits of Alaska and North America imitated nature to create the perfect, weatherproof boot. They observed the polar bears dense, multilayered fur that kept the bear's skin from freezing. The Inuits used the complete paws and legs of these bears (with claws still attached) to create seamless boots. Similarly, the Ainu people of northern Japan used the complete leg skins of deer. Sealskin, caribou hide, and skins of other "waterproof animals were used to make boots, but, again, these had to be cut in pieces and sewn. Multiple layers of wrappings inside the boots insulated the wearer from cold and seeping water but were awkward to wear and maintain. Many northern peoples stuffed their boots with grass for cushioning and insulation, but grass had to be cut and stored for this use during most of the year when it didn't grow. Curiously, some cultures made boots from fish skin but found they were useless in rainy weather. In the Middle Ages in both Europe and Asia, people wore pedestal shoes outside to raise them above water or mud. The sole of the pedestal shoe was made of wood, and the upper was like a shoe and made of fabric or leather. The front and back ends of the pedestal were tapered so the walker could move forward by rocking the tall shoes. Pattens were similar overshoes with tall, shaped wooden bases and mules or slippers into which the wearer could slip her indoor shoes. Shoemaker Nicholas Lestage unknowingly borrowed a concept from the Alaskan Inuits when, in 1663, he made seamless, calfskin boots for King Louis XIV of France by taking the skin from a calf s leg and tanning and dressing it to form a seamless boot. He was forbidden by the king to make his boots for others or to reveal his secret, which was kept for 100 years. Galoshes and many garments were also made by coating fabrics with waterproofing. Linseed oil was commonly used to coat fabric to make oilskins. Other oil or tar mixtures and nitrocellulose (mixed with castor oil and coloring) were used to impregnate or coat fabrics. The fabrics were then heated to oxidize the film left on the cloth and make it stable. Plants, not animals, are the source of water-proof materials in nature. Historical legend has it that the Egyptians were the first to make galoshes from rubber. They made foot-shaped molds out of wood and poured liquid rubber over them. Interest in rubber generally languished for thousands of years. In 1823, Charles Macintosh discovered a way of waterproofing garments by using liquid rubber. He spread rubber that was mixed with a solvent on a marble slab. The solvent evaporated and left a thin sheet of rubber that was then stitched on a sheet of fabric that was then cut and sewn into a garment. Unfortunately, garments made this way did not wear well and were the victims of temperature changes as well as sunlight and grease. It took one of America's greatest inventors to identify the rubber plant as the source of the "perfect" waterproof substance. Charles Goodyear is remembered more often for "footwear" for cars rather than people. Goodyear's dogged determination to find uses for the substance called "india rubber" occupied him for 20 years and exhausted his income. Goodyear was fascinated by properties of rubber including its elasticity, durability, lightweight, and the fact that it was waterproof. The qualities of rubber, however, depend heavily on temperature; it becomes soft and tacky in the heat and turns hard and brittle in cold temperatures. The native tribes of the Amazon had protected their feet with rubber for generations by simply dipping their feet into liquid from the rubber tree and drying the custom-made galoshes over the fire, but the moderate temperatures during the rainy season in the Amazon jungle suited the properties of rubber. By contrast, when the first rubber coats were introduced in the United States in 1823, they were rigid and rattled like metal. Rubber-soled shoes also failed on their first introduction in 1832 because they stuck to floors in the heat and cracked in winter. Goodyear persevered and patented the process of vulcanization in 1844. Vulcanization tempered the properties of rubber so that it was easily molded, durable, and tough. Among the thousands of products that Goodyear proposed to make from rubber were rubber shoes for children, waterproof boots, and rubber "chair" shoes for indoor wearers to eliminate static electricity, noise, and carpet wear. Rubberized elastic webbing was also made possible thanks to Goodyear's studies of rubber, and insets of such webbing were stitched in the sides of galoshes (circa 1890) to make them easy to pull on and off. Thousands of rubber products appeared during the next 30 years as industrialization merged with vulcanization to make rubber products easy to cut, punch, and crimp by machine. Rubber-soled shoes answered the growing interest in sports and became the foundation for the huge sneaker industry. Rubber boots diversified to suit many forms and functions from galoshes to wellingtons, hip-boots, waders, and "body boots." Styles with rubber heels were also made. An outdoorsman named Leon Leonwood Bean revolutionized the style of boots (and mail-order business) when, in 1911, he made a boot with waterproof leather uppers and rugged rubber-galoshes bottoms. The leather portion decreased the weight of traditional boots, but the rubber bottoms gave them the durability to withstand tough conditions. Bean's boots remain popular today and are available in a range of colors. Natural rubber was largely replaced by synthetic rubber due to World War II; by the end of the war, 70% of all rubber was used in the making of tires, and the majority of the remaining 30% was used to manufacture footwear. Rubberized footwear has also been adapted to the workplace where steel-toed rubber galoshes and boots protect toes from heavy objects and the splash-resistant qualities of rubber protect workers from chemicals. Rubber also helps insulate against the cold, protect against abrasions, and guard against slippery surfaces. Although galoshes have been considered practical, their fashion appeal has been limited until recently. Thanks to suppliers of outdoor wear like L.L. Bean and Land's End, new styles of outdoor shoes have become popular. The New England Overshoe Company brought the overshoe into the 1990s through their N.E.O.S. galoshes, which are sturdy, collapsible, practical, and fashionable. Traditional galoshes are made of liquid rubber or sheet rubber. Some styles are lined with fabric and some have fasteners to tighten the relatively loose shape at the ankle. New-style galoshes have rubber bottoms called outsoles. The uppers are made of microfiber fabrics or nylon that have been treated. Fasteners include elastic straps with plastic buckles to tighten the galoshes over casual or dress shoes and elastic fasteners at the tops of the boots to keep water out around the wearer's legs. Until recently, design of galoshes has been limited to providing a waterproof covering to fit over shoes. Because galoshes are intended for limited use (as opposed to all day wear) and because they must fold to be carried in bags or briefcases, galoshes are usually thin or flimsy. Light treads are incorporated into the outsoles, and fasteners are needed to fit the loose design to the ankle. Some galoshes or rubber boots are made in bright colors, others are clear so the wearer's shoes show through, and still others are made in traditional shoe colors like black and brown. 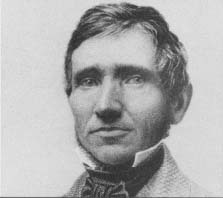 Charles Goodyear was born in 1800 in New Haven, Connecticut, the son of a hardware manufacturer and inventor. In 1826, Goodyear and his bride, Clarissa, opened the first American hardware store as an outlet for the senior Goodyear's products. Both father and son went bankrupt in 1830. For the next five years, Goodyear dedicated himself to experimenting with rubber, in both his own and the debtors' prison kitchens. He had no idea of what to do, having no knowledge of chemistry; he had no money, and only the crudest equipment. The breakthrough finally came in 1839 when Goodyear accidentally discovered the vulcanization process—heating rub-ber-sulphur mixtures to yield a tough yet flexible product. Goodyear struggled through five more years of destitution—at one point even selling his children's schoolbooks—before he was able to patent his process in 1844. Instead of profiting from his finally successful quest, Goodyear granted licenses for rubber manufacturing at ridiculously low prices, and he withdrew from manufacturing himself to contrive new uses for his product. Industrial pirates infringed on his patents, and he paid his attorney, Daniel Webster (1782-1852), more to secure his rights (success-fully, in 1852) than he ever earned from his discovery. He was unable to patent his vulcanization process abroad; Thomas Hancock of England had already done so. In 1860, Goodyear died, leaving $200,000 in debts. N.E.O.S. and other new-style overshoes are lightweight and collapsible because of their microfiber uppers. The outsoles are harder rubber with deeper treads, made possible by the compensating lighter uppers. The ankle strap gives a stylish look, and colors are traditional. There are three different manufacturing processes for galoshes and rubber boots. Some are cut from sheets of rubber, others are made in a process called slush molding, and N.E.O.S. style overshoes are sewn from fabric with rubber outsoles attached. Larger forms of rubber boots are generally made from rubber that is poured in sheet form and uncured or semi-cured to give it workable properties. The nature of the rubber and the requirements for the curing process are part of a formula developed by the manufacturer. The prepared rubber is rolled out and die cut in pieces. The pieces are fitted around aluminum lasts or forms made to suit the design of the boot and the foot and leg size. Sometimes these pieces are coated with talcum powder. The aluminum lasts complete with the fitted rubber are heated cured at a temperature of about 130°F (54°C) to complete the process of forming the rubber to fit the lasts and to meld the pieces together. The talcum powder aids the process of removing the rubber boot from the last. The seams and other parts of the boot are trimmed, and any hardware is added. Shorter rubber boots and galoshes including very lightweight models like Totes galoshes are made by slush molding. For this design, a last is made, and an outer metal mold is also made that is perfectly sized to the last except that it is slightly larger. The cavity between the last and the mold is filled with liquid that consists of polyurethane and other synthetics and a small percentage of rubber, and the mold and its contents are spun to spread the liquid uniformly throughout the cavity between the last and the mold. The mold is removed, the formed boot is taken off the last, and the boot is trimmed and decorated, like its larger cousin. Newer fashions in galoshes merge shoe and boot construction techniques. The outsoles are formed from hard, vulcanized rubber with deep treads. The uppers are laser cut from microfiber or nylon fabric based on computer designed shapes. These uppers may be lined with Polartec, thermal insulation, fleece, foam, or similar weatherproof and chill-proof insulating material that is cut to fit the galoshes. The outer fabric is treated to be weatherproof before it is cut. The outsole is fitted to the last, and the upper is fitted and sewn around the upper part of the last. This fitting is fully computerized. Strong and temperature-tolerant adhesives are used to attach the outsole to the fabric upper. Depending on the manufacturer, waterproofing may be sprayed on the overshoe so that seams and joins have added protection against infiltrating water. Other makers use waterproof, hot-melt tape that is placed over the seams and melted into place to prevent moisture and cold from entering these joins. Manufacturers may also opt for leather uppers that have been tanned with waterproofing. Heel cushions and steel shanks are other options in some models. Finally, the straps, buckles, or other hardware are added. 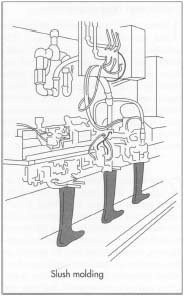 Construction of rubber boots, galoshes, and rubber sections of other overshoes is carefully monitored by technicians trained in the processes of vulcanization, rubber curing, and slush molding. Cutting of rubber and fabric is sized and engineered by computer. Lasts for galoshes and rubber boots are usually only made in full sizes and a limited range of widths, and the variety of designs is more restricted than designs of shoes for example. These considerations help manufacturers keep costs down; overshoes are, for after all, a second set of footwear that are not necessarily chosen for appearance. Technicians also monitor trimming and attachment of fasteners or other accessories, whether these are done by hand or by machine. Lightweight rubber boots and galoshes are manufactured using a process called slush molding. A last is made, and an outer metal mold is also made that is perfectly sized to the last except that it is slightly larger. The cavity between the last and the mold is filled with liquid that consists of polyurethane and other synthetics and a small percentage of rubber, and the mold and its contents are spun to spread the liquid uniformly throughout the cavity between the last and the mold. The mold is removed, the formed boot is taken off the last, and the boot is trimmed and decorated. Byproducts are not usually made by manufacturers of galoshes although they are always alert for marketing and fashion opportunities; for example, weather-proof clogs are made by some overshoe manufacturers to attract customers to a product that is easily put on and taken off and for gardeners and strollers who don't need the benefits of a full boot or the shoe protection of galoshes. Rubber and fabric waste are minimized by computer-aided layouts and cutting. Waste that does result must be disposed. Galoshes have always been useful, if not prized for their beauty. Wily entrepreneurs are always on the alert for methods of modernizing reliable products and for recognizing ways of making them fashionable. The portability and lightweight of Totes, the outdoorsy appeal of products made by L.L. Bean and others, and the trendy combination of fabric and sturdy rubber in the N.E.O.S design are examples of how producers have made reliable "old" galoshes new again. ,#Ben Meadows Company. http://www.benmeadows.com/ . MinAn Chemical Industrial Co., Ltd. http://www.minan.com.tw/ . New England Overshoe Company (N.E.O.S). http://www.overshoe.com/ .